The elementary school-aged children from the Orange Mound Youth Association in Memphis were returning home after playing in a weekend tournament in the Dallas area. At least 45 people were injured. Four children and one adult were hospitalized Tuesday. Authorities are investigating the cause of the crash. 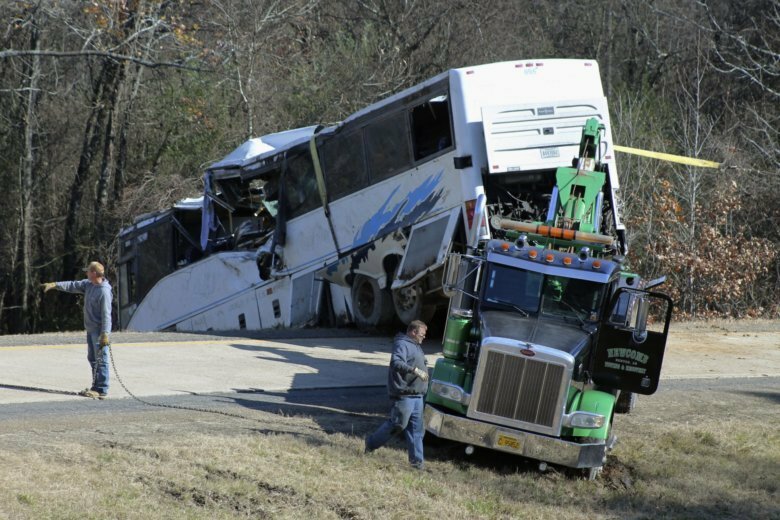 The bus driver, 65-year-old Eula Jarrett of Tennessee, told state police that she lost control. The heavily damaged bus came to a stop after tumbling down a steep embankment next to the crook of a sharp bend on an offramp. Conditions were clear and dry at the time of the crash, around 2:40 a.m., police said. One of the adults on the bus, Damous Hailey, said the players from 10 Orange Mound Youth Association football teams had been competing in all-star squads. He told The Commercial Appeal newspaper that the bus swerved and then flipped “about 15 or 20 times” before landing on its side. “The kids were hollering, and we were trying to calm them down,” he said in an interview Monday from Saline Memorial Hospital, where he was treated for injuries to his right side and leg. The company also was fined in May for knowingly allowing an employee to operate a commercial motor vehicle without the proper licensing. Scott Shuttle Service did not return a call seeking comment on the crash. Officials from two school districts in Memphis said students from several of their schools were hurt. Aspire Public Schools, which runs charter schools in Memphis, said the dead child attended one of its schools. The crash has shaken the community of Orange Mound, a historic, mostly African-American neighborhood that takes pride in its youth athletic programs. Shelby County Schools is helping to gather money for the children and their families. Funds also are being raised online. “This team represented our city in a championship game & then experienced this horror heading home. My deepest sympathies & prayers are with each child & family,” she wrote on Twitter. Associated Press writers Jill Bleed and Hannah Grabenstein in Little Rock, Arkansas, as well as researcher Jennifer Farrar in New York, contributed to this report.